so halloween was two weeks a go and i guess we've been on a candy hangover because we haven't had a chance to detail what a great time we had --- until now. there has been a lot going on, but we wanted to share some pics from our party and all the trick o' treating madness that ensued. alex went as a snowy owl (tutorial on the making of that costume coming soon) and evan and i went as google fiber - which if you don't know about you should totally google it to find out. 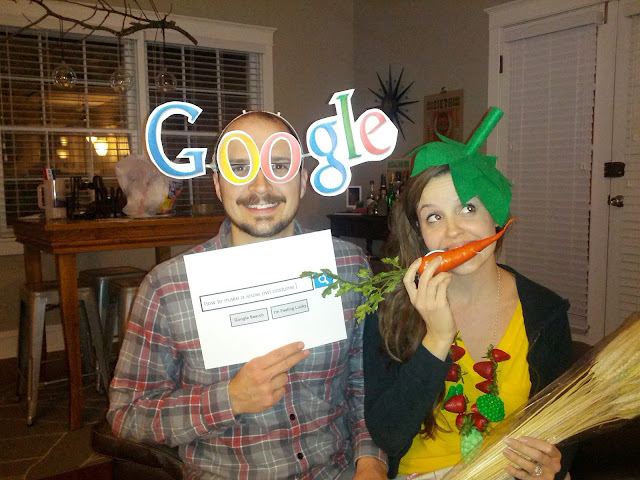 he was google, i was fiber. together we were awesome. overall it was another great party and we just want to extend a huge halloween thanks to all of our friends who come back each year to celebrate with us. we love this tradition and plan to continue it for many years to come. hope your halloween was killer too! We had a great time! We look forward to the party & trick or treating with friends every year now! This year Hollywood couldn't have made it so perfect, great friends, weather & fun! Love you all!